I'm either getting a bit tired of the Elm Creek series or Chiaverini is getting a bit tired of writing them. Much of what is in this book is in several of her past novels; and I'm not sure this book even qualifies as a novel. There was some new stories about some her characters, but not that interesting or enticing. If you hadn't read the previous books,this book would not entice you to read another and if you have read the previous books this one was more often boring than not. Personally, I'm close enough to having read the complete series to date, I'll finish them. I know that #16, The Lost Quilter is good, because it's the book that got me into the series in the first place, there is hope for #17, the Aloha Quilt. Don't get me wrong....I love the ladies from Elm Creek. They feel like old friends and for the most part I enjoy visiting them. What I don't like is rehashing OLD stories that we're already familiar with.....boring!!!! Sometimes these small holiday books feel very formula to me and end up rubbing me the wrong way! There was one character though that I really enjoyed in this book-Gretchen. I'm a die-hard fan so I'll read the next one but I'm hoping that it isn't another "let's feel good but not talk about anything substantial" book!! This might seem an odd read for a non-quilter, especially since this is the fifteenth installment in the series and I haven't read a single one! I simply picked this up at a library book sale and decided it looked like a delightful, easy Thanksgiving read for a busy Holiday. We follow a bunch of sweet ladies who meet each year at Elm Creek Manor the day after Thanksgiving, which coincides with the first day of quilting season. They sew all weekend and catch up on each other's lives. This story is rich in cozy detail. From the intricate stitching detail on the gratitude quilt blocks, the descriptions of food, and the stories of the women as they talk about their year, this book is like a giant blanket. It also felt like I was watching a Hallmark movie, with perhaps a bit less cheese.I had fun with this and liked that it was exactly what I expected. It made me want to take classes at my local JoAnn Fabrics! There was an interesting section about how most people who take up the hobby quickly realize that it is more than a frivolous venture. The mere act of creating does the mind good, but the collaborative effort with other people is enriching as well and has substantial benefit for health and happiness.I'm sure I would have a bit more context if I'd read some of the other books, but that didn't seem to matter as everyone was introduced adequately. In my opinion, you could read this as a standalone and it would be fine. I don't know how this book compares to the rest of the series, but if you like quick, enjoyable, and heartfelt books about friendship, food, and quilting, this seems like a good choice. This is book 15 in the Elm Creek Quilters series, and I really like how Jennifer changed things up from some of the previous books. This one takes the focus away from Sylvia and puts it on the ladies that come to the manor to quilt.I loved everyone's stories. Gwen, Gretchen, Diane as well as the new cook, Anna, who we met in The Quilter's Kitchen get to shine. All of these women have something to give and we learn that as we see what brought them to Elm Creek Manor. Oh and we also get more of Sarah and Matt, who are expecting twins now!Chiaverini lets us see some marital issues, as well as people trying to hold on to traditions and making new ones through past actions. Each woman has a special story and you really will come to love them. I think I loved Gwen and Gretchen the most. Gwen made her mistakes but was able to overcome those and we hear how one woman really influenced her life. Then there's Gretchen who has a wonderful ability to give of herself.Sylvia also gets some good news in regards to her cousin Elizabeth's family. That really brings a tear to your eye, because Jennifer Chiaverini really drives home how much Sylvia loved this cousin in most of the books.This book was set on the days following Thanksgiving. Almost all of the Elm Creek books revolve around the year end holidays. I loved the discussions of food for the pot luck lunch that the ladies have for their special get together after the holiday.This was such a sweet cozy read. I always look forward to reading about the quilting ladies. A Quilter's Holiday, by Jennifer ChalverniHave read most of the other books in this series and enjoy not only the patterns but the friendship others get by coming together to sew for charity.Love hearing of the occupants of the house and what the latest is with their families.Thanksgiving tradition by sewing quilt blocks and why they selected that particular one..Quilting marathon and everyone has brought a leftover dish from the special day to share with all quilters that have assembled. Snow is due and a lot of it.Loved hearing of how to name a quilt and of the advent calendars-much like the one our kids when younger had.Loved learning of the importance of the 9 block and how many other things in our lifes correlate to it.Alternating chapters from those at the celebration talk about what's going on in their lives. So many mysteries and clues throughout.Auction of their items, proceeds go to food bank, so generous! Hate that the snow brings about a lot of tragedies....love hearing of the winter get together and where the proceeds for that go.I received this book from National Library Service for my BARD (Braille Audio Reading Device). I used to like this series of books, but they have become too predictable as the series has gone on. I grabbed this book from the library thinking, "Hey, it's a Christmas book and I'm in the Christmas spirit." Well, thankfully, I'm actually in the Christmas spirit because otherwise I wouldn't have finished the book. The basic plot is that it is the day after Thanksgiving and the Elm Creek Quilters all meet to start/finish/continue their Christmas projects. Each of the quilter's has her own thoughts about why she is making her individual project and, of course, they all get snowed in together in a freakish early storm. The plot is a classic set up of back flashes and memories, but I was only marginally interested in each of the stories. I think that I will give the Elm Creek Quilters a rest for a while. I wasn't even captivated by the cliff-hangers--I think that I can already figure out what will happen. This was very disappointing. I used to enjoy this series. This book seemed like a rehash of previous books. Plus a couple of the characters were so nasty to each other, it became unpleasant to read. I still have a few of these books on my shelves left to read. I am seriously debating whether or not to just give them away and not waste my time. I haven't decided if the author is just gotten complacent in her writing or my taste has changed to the point where these books just don't interest me anymore. This book didn't help win me over. This was a wonderful book. I have liked all of the Elm Creek series and I figured this would just be a typical "holiday" book, a quick read, not much content. I was totally wrong. This book gives quite a bit of backstory to many of the characters. It also left quite a few "cliff hangers" for future books. I don't think I would recommend this book for someone that hasn't read the rest of the series; I'm not sure a "new" reader would be able to pick up at this point (this is the 15th book in the series). This is a favorite series at our library & it's hard to get the books out in order. I did not realize this was #15 in the series. I picked it up because I had read the recipe book, The Quilter's Kitchen, where I met Anna, & thoroughly enjoyed it. I expected it to be a holiday book with not much substance to it. I enjoy it when Chiaverini gives us back stories & weaves the stories together. Another wonderful series. I always look forward to hearing more about the Elm Creek Quilters. It always gets me itching to start quilting. Excited about the entire series. This book is as warm and cozy as the homemade quilt. The characters are multi-faceted. 3 may be generous. This was light and fluffy, so for someone who likes a feel-good read this is for you. Easy and fast read, and the author does add some depth to the characters. I have always said there are three sides to every story; Side A, Side B, and the truth. I enjoyed how she wrote the same story from the perspective of everyone at the retreat. It was the same event, but everyone experienced it differently. I found the character development rushed, but then again this is a series of books and i only read the one, so many i am missing a great deal by not having read the other books. Selah, Grottoes patron, July 2017, 3 stars:This one takes place right after Thanksgiving when the Elm Creek quilters get together to quilt. It is not as good as most of her other books. It does carry the story of the ladies lives further along and seems like a preparation for her next book. Another good Elm Creek Quilt story. Parts of this book retell information from previous books, but that did not distract from the story for me. I enjoy the ongoing stories of the characters that Jennifer Chiaverini has created in this series. Ending the read with a few books from my favorite series Elm Creek Quilts. This is a wonderful feel-good read that helps you prepare from Thanksgiving to Christmas. Each quilter shares the project they are working on and the "giving" theme calls on all of us to do more for others. I am reading the series in order. I feel like the books are acting like movies, leaving open questions at the end. The next two books do not deal with the same people so those questions are going to be unanswered for at least three books. Not sure I like that. It was a good book but I've enjoyed her other books more. This book was very enjoyable. As women came together to make a quilt, for it makes them relax and enjoy each others company and even become good friends. A sweet little easy read (one day for me) reminding me of why I loved these Elm Creek Quilter Books so much. I enjoyed this story because it gave a background of all the main characters. Definitely not as good as the Christmas version. There were almost too many characters used. Some of them were a little whiny. I would have like more tie-ins with quilting. I enjoy this series. I had difficulty reading the ending of this book through happy tears. Has me pondering what quilt block patterns I would choose while spending the day after Thanksgiving quilting with a group of friends. What are we thankful for? Can we put that into a quilt? Loved reading about what the Elm Creek Quilters are thankful for and how they will show this thankfulness. I almost didn't pick up this book. 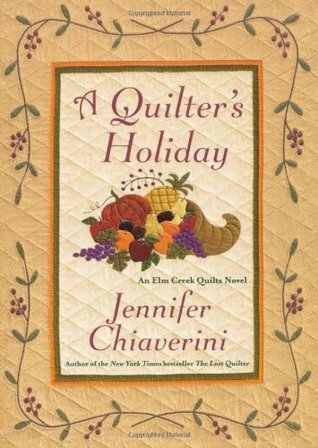 I've liked most of the Elm Creek Quilt books I've read, but I think Jennifer Chiaverini needs to put the series to bed and write something else. There is a compelling element to these stories, however, and I'm sure that is what keeps people reading them. I have mixed feelings about this one. It's a shorter, holiday novella style book that takes place over the course of two days and is easily read in one sitting. This one shares viewpoints from each quilter, and we do learn a bit more about each one. However, there are still redundancies, just like there are in past books. Diane is the character I like the least and she whines and snipes her way through this book. Yes, her issues are wrapped up neatly at the end, just like everyone else's, but to say she is annoying is an understatement. Sarah and Matt end the book with somewhat unresolved issues and Sylvia discovers more answers to her family history. So I have no doubt that at least one more Elm Creek Quilt book will be published: one that features a return to Elizabeth's story from The Quilter's Homecoming. Another one dealing with Sarah and Matt and the birth of their children is probably on its way as well.Thanks to my local library for having a copy I could borrow. Because my library has them, I might pick up the next ones. I don't know. Like I said, there is a compelling element to these stories and kudos to Jennifer Chiaverini for capitalizing on it. If you've liked the rest of the series, you will probably enjoy this one. A Quilter's Holiday begins the day after Thanksgiving when the Elm Creek Quilters gather at Elm Creek Manor to spend the day stitching and quilting gifts for loved ones for the holiday season.During a recent remodeling of the kitchen at Elm Creek, Sylvia had found a cornucopia that once was the centerpiece of the Bergstrom's family holiday table. Sylvia had each of her quilting friends sew a quilt block that represented their thankfulness and gratitude.On this day after Thanksgiving a really bad snowstorm develops and one of the quilters, Diane, wishes to go back home to her family as her two sons are home just a short while for the holiday. It had been sleeting and snowing pretty awful, but Diane sets out for home. She does not get very far and becomes stuck in the snow with her car. Her cell phone, which she often forgets to recharge, is dead and is unable to contact anyone on her whereabouts. After a period of time, she gets out of the car and starts back to the manor. Luckily on her way back, Jeremy is returning to Elm Creek and comes upon Diane and brings her back to the manor also. Jeremy had been on his way to see his girlfriend, Sarah (a former Elm Creek Quilter), in Chicago; but the snow storm had him turn around and come back. Everyone is glad to have Diane safely back and asks Jeremy what he is doing back.As the winter storm continues to blanket everything, the quilters find new meanings for their traditions and new reasons to be thankful. The 15th book of the Elm Creek Quilt series returns to the current day, surrounding their own Thanksgiving tradition of a day after party with each potluck item having a leftover component. They have added a tradition of putting a quilt block in the family cornucopia which represents what they are thankful for. The ladies are all facing some changes or challenges. Sarah has to deal with her husband's wish to help his father's business, which will mean a separation between them during her pregnancy, Diane is dealing with her need for tradition versus the practicality of her sons growing up, Sylvia has found out that she may indeed have living relatives in California that are descended from her beloved cousin, and Anna, one of the newer characters, is dealing with her growing feelings for Jeremy, who is her friend, but also the long distance boyfriend of Summer, one of the original Elm Creek Quilters and daughter of Gwen. The story goes back through the timeline from different characters perspectives, with the drama/excitement coming from a snow storm that threatens two of the characters who have ventured out into it. This was a nice addition to the series, and was a light, enjoyable, and quick reading experience. Jennifer Chiaverini - Jennifer Chiaverini is the New York Times bestselling author of several acclaimed historical novels and the beloved Elm Creek Quilts series, as well as six collections of quilt patterns inspired by her books. A graduate of the University of Notre Dame and the University of Chicago, she lives with her husband and two sons in Madison, Wisconsin. About her historical fiction, the Milwaukee Journal Sentinel writes, "In addition to simply being fascinating stories, these novels go a long way in capturing the texture of life for women, rich and poor, black and white, in those perilous years."